This interesting surname is of English locational origin from a place "Harpham", in Yorkshire which was called "Harpein" and "Arpen" in the Domesday Book of 1086, "Harpenna" in the Pipe Rolls in 1130, and "Harpham", circa 1160, in the Yorkshire Charters. The place gets its name from the Old English pre seventh Century word "hearp", harp (possibly denoting a place where the harp was played, or else from the device called the "harp" and shaped like one, which was used for purifying sea salt), and the second element "ham" the Old English word for "homestead, settlement", a common element in place names. Xpofer Harpam was christened at Snaith, York on November 21st 1562, while one Brian Harpam married William Elliot at Kilwick, York on May 26th 1573 and one Margaret Harpam married a Robert Browne at Doncaster York on June 24th 1576. 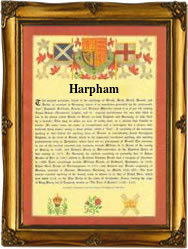 The first recorded spelling of the family name is shown to be that of Thomas de Harpam, which was dated 1379, Poll Tax Records of Yorkshire, during the reign of King Richard 11, "Richard of Bordeaux", 1377 - 1399. Surnames became necessary when governments introduced personal taxation. In England this was known as Poll Tax. Throughout the centuries, surnames in every country have continued to "develop" often leading to astonishing variants of the original spelling.